This is the third since 2006 that Fiat has had to fix the Grande Punto's steering. TURIN -- Fiat Group Automobiles is recalling 500,000 units of the Fiat Grande Punto -- the company's top-selling car in Europe and worldwide. This is the third time since 2006 that Fiat has had to fix the car's steering column. The current recall -- by far the largest of the three -- affects units of the Grande Punto and Grande Punto Abarth built in 2008 and 2009. Fiat, which voluntarily started to fix the problem last month, says that half of the cars were sold in Italy and the other half in the rest of Europe. The automaker says that no accidents have been reported due to the problem. In November 2006, Fiat recalled about 21,000 right-hand-drive versions of the Grande Punto sold in the UK due to a faulty steering column fastening. 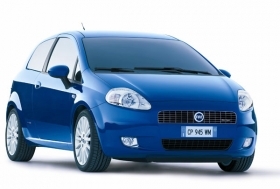 In March 2008, Fiat recalled almost 44,000 left-hand-drive Grande Punto models built between March 2006 and September 2007 for unspecified problems in the lower part of the steering column.